Torrential rain in Braselton, Georgia forced officials to red flag the 10-hour Petit Le Mans after four hours and 50 minutes of racing. The Road Atlanta circuit was drenched and there was no hope of drying the track. 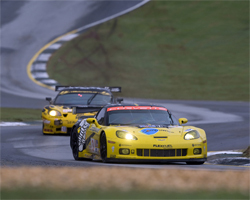 Torrential rain forced officials to red flag the Petit Le Mans after only a few hours of racing, photo by GM Corp.
Two Corvette C6.Rs dominated the first three hours of the Petit Le Mans Race in Braselton, Georgia, photo by GM Corp. When the race ended Corvette Racing’s No. 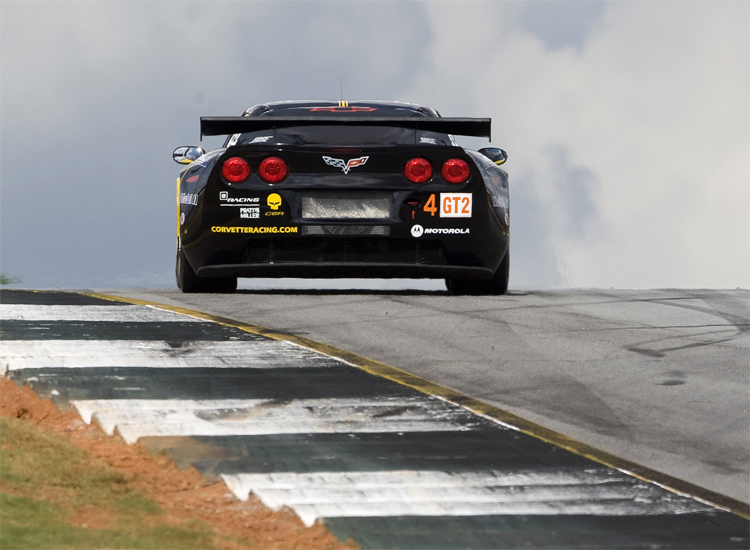 4 Compuware Corvette C6.R was fourth in the GT2 class, one lap behind Risi Competizione’s GT2-winning No. 62 Ferrari 430. The No. 3 Compuware Corvette C6.R was classified sixth, only two laps down. 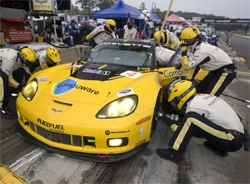 Oliver Gavin pits on the Road Atlanta circuit in Corvette Racing's Compuware Corvette C6.R, photo by GM Corp.
Corvette Racing's next event is the Monterey Sports Car Championships at Mazda Raceway Laguna Seca in Monterey, California, photo by GM Corp. 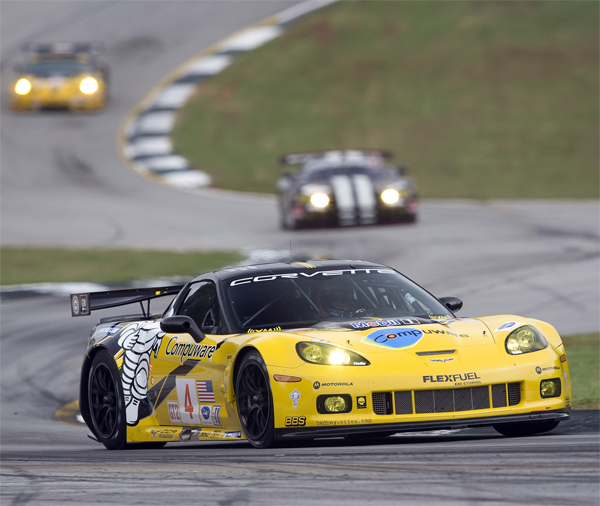 The two Corvette C6.R’s dominated the first three hours of the race. They ran first and second consistently until a flurry of pit stops mixed the running order. That’s when the heavy rain arrived. The Corvettes changed to rain tires and quickly asserted themselves at the start. Oliver Gavin took the No.4 Corvette C6.R to second and Johnny O’Connell slotted the No.3 Corvette C6.R to fourth on the opening lap. Gavin made a move to pass the Ford GT of David Murry in the Turn 10 chicane on the second lap, but lost grip and fell to fourth. O’Connell immediately applied more pressure to the No.3 Corvette, taking the lead on the third lap with an inside pass going into the high-speed first turn. On the fourth lap, Gavin passed the Flying Lizard Porsche of Patrick Long to take third place. A dry line started to emerge and the Corvette crew made the decision to switch from rain tires to slicks on the first pit stop. Gavin was the first to pit at the 45 minute mark, with O’Connell stopping two laps later. Following the pit stops, Gavin emerged at the front of the GT2 class with O’Connell comfortably in second. The Corvettes made their first driver changes during a full-course caution after 62 laps. Jan Magnussen replaced O’Connell and Olivier Beretta replaced Gavin. A second full course caution closed the field. During the third yellow flag, Corvette made another change of drivers. Antonio Garcia took over the class-leading No. 3 Corvette C6.R and Marcel Fassler drove the second-ranked No. 4 Corvette C6.R. The Corvettes suffered a setback during a fifth caution. They ceded track position to Marc Lieb in the No. 45 Porsche, and Joerg Mueller in the No. 92 BMW. That put Fassler in third place and Garcia in fourth. The weather continued to deteriorate and the downpour began at 4:28. O’Connell aquaplaned off the track in the downhill Turn 12 and was beached in the gravel trap. Quick work by the IMSA safety team had the No. 3 Corvette back on the circuit after only losing one lap. The downpour intensified and race officials displayed the red flag and stopped the race at 4:50. The clock continued to run while the cars were parked in the pit lane, and the race was terminated three hours and 55 minutes later. 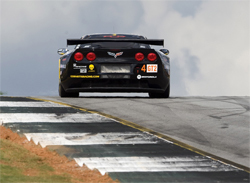 Corvette Racing’s next event is the Monterey Sports Car Championships. The four hour race is scheduled to start at 2:45 p.m. PST on Saturday, October 10 at Mazda Raceway Laguna Seca in Monterey, California. SPEED-TV will broadcast the race on Sunday, October 11 at 2:30 pm EST.